What a difference a little bit of rain makes – well, a lot actually. When we last left Kenya in October 2017, everything was desperate. There had been little rain for that year and the preceding 4 years, the average farmer had lost more than half of their livestock with some losing all. When we arrived mid March, it had been raining for about 2 weeks, the grass was re-growing and green and the animals were starting to look healthy. There were a few days of torrential rain which brings its own problems. 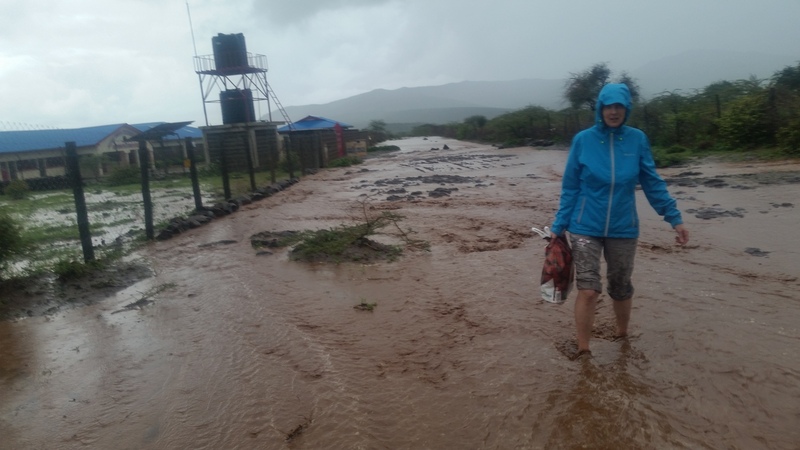 Reaching our school becomes difficult as the mud tracks turn into makeshift rivers (see below). There are no bridges across the proper rivers in this area so the normal route of hopping across the large stones becomes impossible when the rivers become a raging torrent of water. During our short time in Kenya, 4 children from a school about 10 miles away died whilst trying to cross a river on their way to school. It’s near the end of term so sports day. However, it’s not the kind of sports day that you or I would remember. 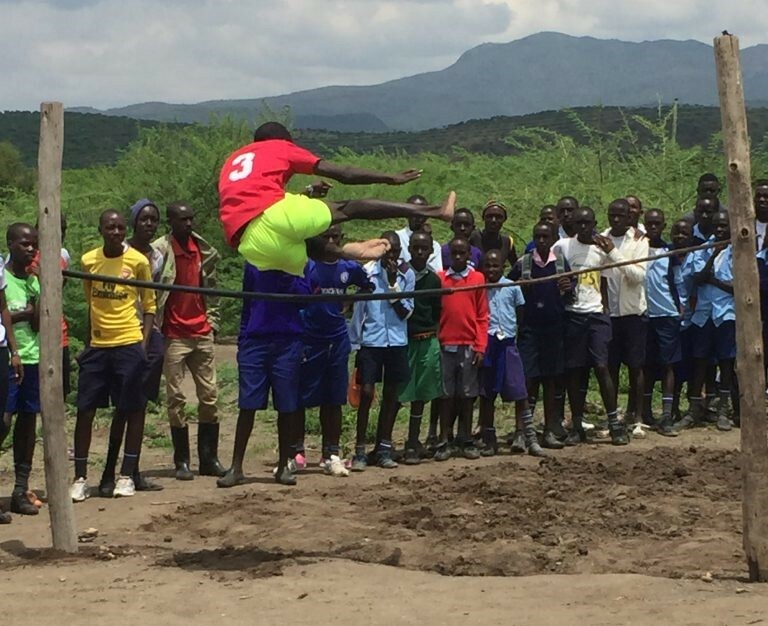 Primary children run, jump and throw against each other but school against school rather than age against age. Since some children miss many years of primary education, a child can be 20 before they leave Primary school. So you have a 10 year old running against someone who is 20. Guess who wins? In the long distance races, children often wait in the bushes just waiting to come running out for the last few laps. The photo below shows the high jump. No sand or soft landing area so the jumping method is to spring from both legs then bend your knees up to your chin as you clear the bar and land on your bare feet. 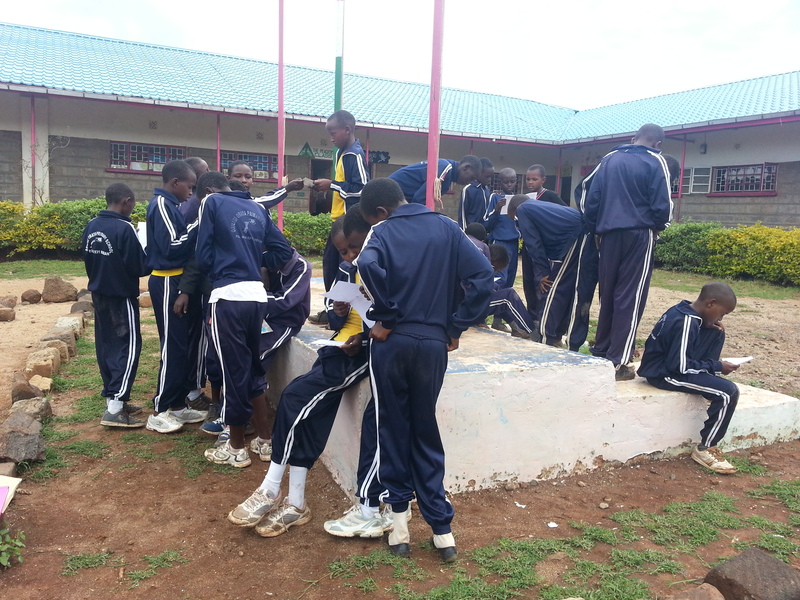 We mentioned in the last newsletter (link here) that Kenya was introducing a new curriculum. Although teachers have been given very little information about the new curriculum, we have had to introduce it to 5 of our classes since January. The curriculum is skills based rather than the old knowledge based, so, for example children learn about keeping chickens by having some chickens around rather than just reading about chickens in a book. 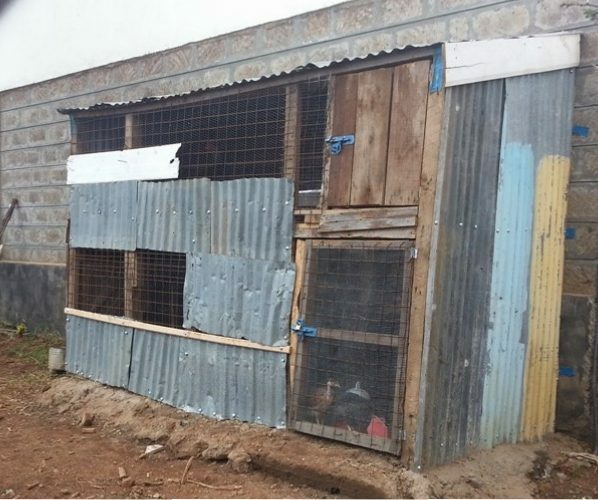 The photo below shows the school’s chicken coop constructed from waste material by Dadio, one of the boys in the orphanage and Wambua the caretaker. 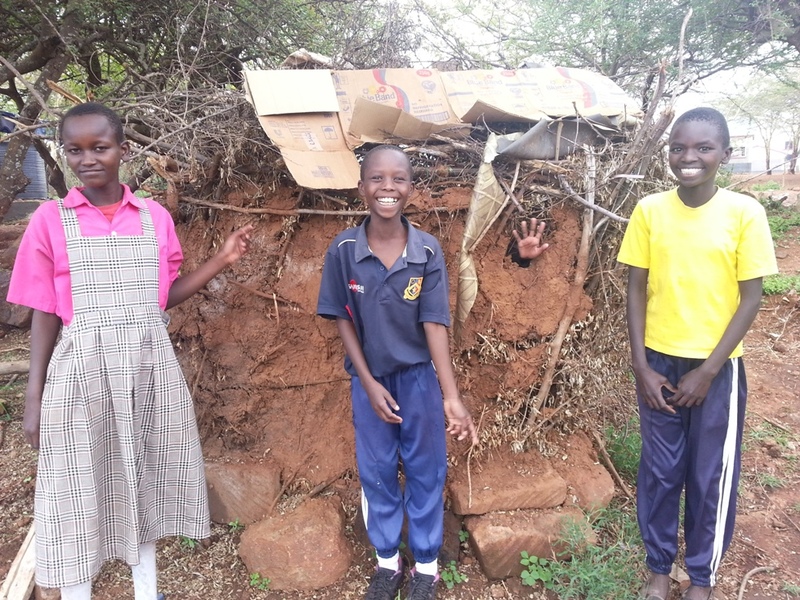 The girls learn about building a traditional maasai hut, a task always undertaken by the women in Maasai tradition, using twigs, cow dung and mud. Here is a photo of their efforts. Maasai mud hut built by the children. To help the transition to a skills based curriculum a Scottish head teacher, Margaret, has kindly offered 2 months of her time to help the school’s teachers and head teacher. Margaret is half way through her first month and is showing and teaching the teachers how to get the children more involved in their learning. Margaret is writing a daily blog about her experiences and this can be seen here. One unexpected area she has been catapulted into is on corporal punishment. The school recently had a bad case of beating by one of the new teachers when a class of children did not meet with his learning expectations. The teacher is no longer with the school and Margaret is spending much time showing the teachers Positive Behaviour Management techniques. Although illegal, Kenya is a country where beatings are common, but they will not be tolerated in this school. A new Baby class started in January. It should have been 25 children but somehow had grown to 32 with a number of underage teachers’ children. One more thing to sort out! 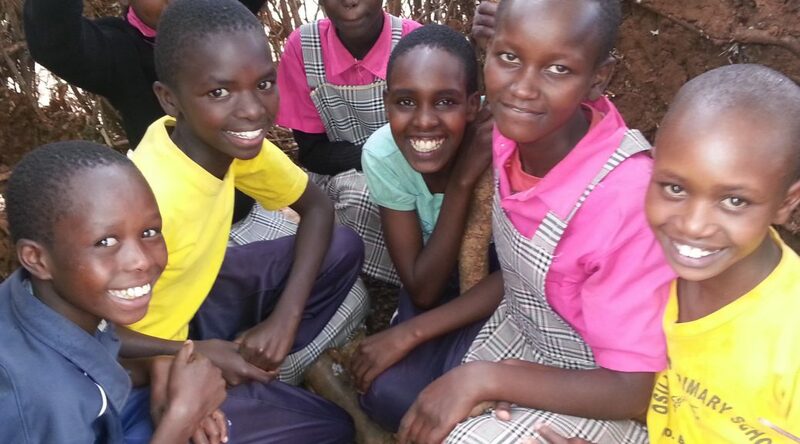 The school now has 9 classes with 245 children. A couple of new initiatives from the Kenyan government. Firstly, there is now a central register of all school children. Every school child must have a school registration number that relates to their birth certificate, to be completed by April. This is probably to stop Government funded schools from inflating their number of pupils and so getting extra funding. However at our rural school, around 95% of children do not have birth certificates and the Government system to create them is creaking under the strain. Strangely, if a parent greases the official’s palm with a little cash, the birth certificate can be done much faster. Secondly, plastic bags are now banned in Kenya. It took us about 30 minutes to repack and remove all the plastic bag contraband from our luggage to avoid a possible 4 year imprisonment or £300 fine. The local village of Kisamis, which used to be covered in used plastic bags, is now noticeably cleaner. Water – with all the rain it is easy to forget that once the rain stops, clean sources of groundwater become so very important. We have now repaired more than 450 hand pumps installed by other charities. I cannot promise that all are still working but each pump caretaker has received a training course about how to make simple repairs to keep their pump working. The women caretaker being trained in how to replace pump seals. The 2 very deep solar powered pumps in Olepolos continue to serve their communities. The one at the school pumps 4000 – 6000L of water each day from 500’ below ground, just using the power of the sun. The other solar pump, about 3 miles from the school, has been more troublesome. The community is responsible for looking after this pump and twice people have tried to steal the solar panels. The panels cannot be removed but are easily broken and every time they are broken, the pump stops working. It’s now all working again just waiting until it is needed in the next drought. The children are always interested to hear about their sponsors in the UK, as you can see below. Class 6 receiving letters from their sponsors. As usual a very informative newsletter.How nice to have an English teacher offering support and new teaching styles. Great newsletter thank you. So interesting to hear about the school and all the challenges. Thanks for all you do and for keeping us so well informed. Thanks for looking for jigsaws and lego. If the jigsaws have an educational theme then that’s even better. Loved reading this update- and receiving photos in an earlier email of our child in the baby class. Thank you for all you do! As a teacher, I’m so pleased to read about skills-based curriculum and that teacher training is being volunteered by Margaret. Fantastic! The meals seem to be bringing enormous benefits when I compare the photos I receive. A timid little boy has turned into a confident, happy schoolboy. Thank you for all you are achieving. Thanks for the comment Sonia. The school meals are indeed very important, especially during the drought times when the mothers have no money to buy food. Hi Helen and Roger, as you know I have seen the school since the days when it was only buildings and no children. Over the years Janet and I have been happy if not to say blown away by the progress of all your projects. Our greatest joy has been to see the way the children have grown happy and healthy. Unfortunatly my days of travells to Kenya and the school are now at at an end, but it will be joy to continue recieving your news letters. It is a hi-light of my life to have played a part, all be it a small one, in helping your projects. Thanks for your comments Derek. I will make sure that we continue to send you the updates. As always, you’ve achieved so much in another packed visit. It’s great to see the children thriving … it’s reassuring that you keep things on track. It’s a team effort Susan. Everyone plays their part in making it happen. Thank you Helen for all the interesting information and photographs. We do appreciate you keeping us informed about what is going on at the school – it’s the next best thing to being there. Incidentally, 245 is exactly the same size as the primary school that our children attended in Lancashire. Edward was a governor there for many years. Thanks Gill. In a few years time the numbers will be closer to 300. Two more classrooms to build and fill. What a great read as always. We all need to be reminded to be grateful and thankful of the blessings in our lives and the wonderful people who form the fabric of our experiences. Thank you Roger & Helen for this newsletter. I appreciate you! Appreciation is a form of love, that’s why it’s so powerful…don’t forget to appreciate yourself! Thanks for the update Roger. Fantastic to read all the news and keep up to date with such brilliant progress in all directions. Our five teachers are busily putting together our school trip from Bournemouth next February 2019 – we can’t wait to be there, to help play a small part.